On arrival in Sri Lanka you will be met at the international airport. Your tour begins with your transfer to a hotel in Sigiriya. Check in and relax. In the evening you can climb the Sigiriya rock fortress. Sigiriya was built by the patricide King Kashyapa in the 5th century A.D. Climb up the winding staircase to see the famous frescoes of ‘’ heavenly maidens." After breakfast leave for Wasgamuwa. En route visit the rock temple at Dambulla. The journey passes through beautiful forestland and amazing scenery. Upon arrival at Wasgamuwa you can check in at the lodge. In the evening leave for a Safari at Wasgamuwa. Wasgamuwa is a known for siting of elephants. Besides elephants, you might spot leopard, sloth bear, sambhur, spotted deer, barking deer, wild boar, wild buffalo, Torque Macaque, Purple face leaf monkey and nocturnal slender Loris. Birds include the Wooly necked stork, painted stork, Racket tailed Drongo, Yellow fronted barbet, Sri Lanka Jungle fowl & Spur fowl. Overnight in Wasgamuwa. Basic Accommodation facilities. After breakfast leave for Kandy via the knuckles mountain range. You will pass thick forests, streams and exquisite fauna and flora. Check into hotel in Kandy. Do a city tour. Visit the temple of the sacred tooth relic of Buddha. In the evening watch a Kandyan cultural performance. After breakfast visit the royal botanical gardens of Peradeniya, then visit the elephant Orphanage at Pinnawela. P.M. leave for Nuwara Eliya, a town called "Little England" surrounded by tea plantations and panoramic views. En-route visit a tea plantation and watch a demonstration of the manufacture of the world famous ‘’ Ceylon tea ‘’. Spend the evening walking around in the cool climate. ​Overnight at hotel in Nuwara Eliya. After an early breakfast proceed to Kitulgala stopping on the way at Horton Plains Nature Reserve for a guided tour. Horton Plains is another wildlife hot spot, the vegetation consists of grassy woodland. The plains are home to species such as the sambar, leopard and endemic purple-faced langur. From here you will continue to Kitulgala. You have the option of water rafting in the river. (Minimum 2 persons are required & payment direct). ​Overnight at hotel in Kitulgala. After an early breakfast start exploring the rain forest. Due to the dense vegetation wildlife viewing is difficult. You might spot some of the brightly coloured birds of the region. In the afternoon leave for Bandarawela. Overnight stay at hotel in Bandarawela. After an early breakfast you can commence trekking in this small town after which you will travel south to Udawalawe National Park. ​The vegetation here is mainly open parkland with some mature teak trees. The park is home to around 400 wild elephants, golden jackal, crocodile and buffalo. The afternoon will be spent on safari in the national park. After breakfast you will head to the south-east corner of the island. Yala National park which is the most famous of all Sri Lanka's parks. You will see an amazing variety of wildlife within open park land and dense forest set among fresh water rivers and lakes beach access. Yala is known to have the world’s highest concentration of leopard (though this still does not guarantee definite sitings!). In the afternoon you will set off on another safari in the Park. After breakfast you will travel to your beach hotel down South. Your journey will take you along the scenic coastline. You will see fishermen on stilts between Weligama and Unawatuna. Taking photographs of stilt fishermen might incur a charge by the touts here. They might harass you for a payment. Another day of relaxing and enjoying the sun and sea. You can hire a boat to take you over to the lighthouse situated on an off-shore island. A steep climb to the top offers fantastic views of the coast. 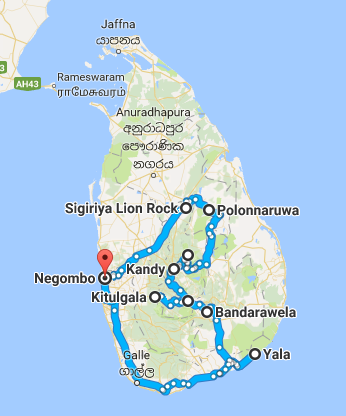 After breakfast leave for Negombo, en-route visit Galle. Visit the Old Portuguese Fort. View the ramparts. Take a boat ride to a village situated on an island in the Madhu river. Visit a sea turtle hatchery. Overnight at hotel in Negombo. DAY 14: Tour ends Today, a transfer vehicle will be provided to take you to the airport for your outbound flight. All rates are in US Dollars & net per person inclusive of all taxes. There has to be a minimum of two pax per reservation. If you are traveling alone please contact us for further details. *Super Peak Period – 20th December 2011 to 15th January 2012. For Reservations for the above period, please contact us for further details with your specified dates. As Peak supplements apply at hotels during this period & this will change according to the category of hotels & the date of reservations. Single room supplement, the personal spending (tips, laundry, mini bar, telephone, fax etc ....) Beverages, the rights to use cameras or video at sites where most places they are free when you pay the entrance fees except at Kandy Tooth Temple & Pinnawela Elephant orphanage there are extra charges for Video around USD 05 per person, medical expenses, insurance, international flights. Sri Lanka Visa charges apply. Please visit this site. http://www.eta.gov.lk/ to obtain a visit visa..Your passport has to be valid for six months from the day of arrival + return air tickets & sufficient funds or reservations for the holiday should be with you. All visitors have to obtain a visit visa except for Singapore & Maldivian passport holders. Welcome at the airport by our representative. Tour based on Five Nights on Bed & Breakfast Basis & eight nights on Half Board Basis (Room + Dinner + Bfast). Total thirteen nights. The accommodation in half twin/double basis in the hotels mentioned or similar. check-in/check-out 12h00. Meals start on 2nd day Breakfast & ends on Last day breakfast. The excursions sightseeing & visits as per program without entrance fees. (To be paid by clients directly all entrance fees). English speaking chauffeur in air-conditioned private Vehicles will be provided. Fuel and Local insurance for the vehicle included (No vehicle on free days unless specifically mentioned in the program). Working hours of chauffeur will be between 08h00 to 19h00 on any given day but this can be modified by discussing with the chauffeur. Sufficient resting time has to be provided for the next day’s trip. (Arrival & departure transfers can be at any time).